Each year, FirstWorks curates a spectacle for PVDFest that creates indelible memories! 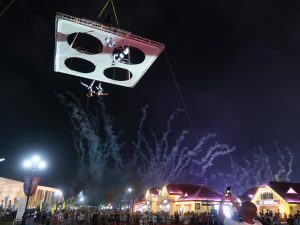 Born from a dream of dancing on a flying wall, Quadro is a stage suspended high in the air from a construction crane. Direct from Italy, eVenti Verticali bring their stunning blend of theatre, circus acrobatics, dance, music, comedy and new media on aerial stages, for a stunning PVDFest highlight featured on Friday, Saturday, and Sunday.